The Mylapore Social History project's opening article on Palathope focused on establishing the fact that Palathope (today Vedanta Desikar street) was primarily a lawyer's enclave, then went on to profile a few leading personalities who lived on the street and concluded by inviting opinion from the reading public on the sociological and economical drivers behind this phenomenon. What circumstances caused generations of legal eagles to 'graduate' from Palathope? Their 'graduation' into the world of litigation and trial linked surprisingly, more definitively to this sleepy, little lane, rather than to any academic institution of law. Was a societal creation like a 'neighborhood' solely determining the choice of profession amongst multiple generations of residents or were there more complex factors at play? Were there facets to Palathope other than the black robe and the white collar? For this concluding article on Palathope, I meet with a group of old-time residents of the street at the gracious bungalow of Justice V. Ratnam. 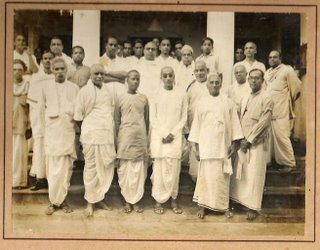 This article hopes to probe further, and examine why Mylapore was a force to reckon with in legal power circles, why Palathope was the fulcrum of this movement and on a lighter note, why young women in the 1940's blushed with a quiet sense of pride when they were asked 'Mylapore Vakil Aathu Ponnu aa nee?'…. The late 1890's and the early 1900's saw a large-scale migration of families from the rural districts of Tamil Nadu into the city of Madras. Temple priests, farm-laborers, agricultural land owners, all moved from the small towns Tindivanam, Mayiladuthurai, Thanjavur and the like into Madras. 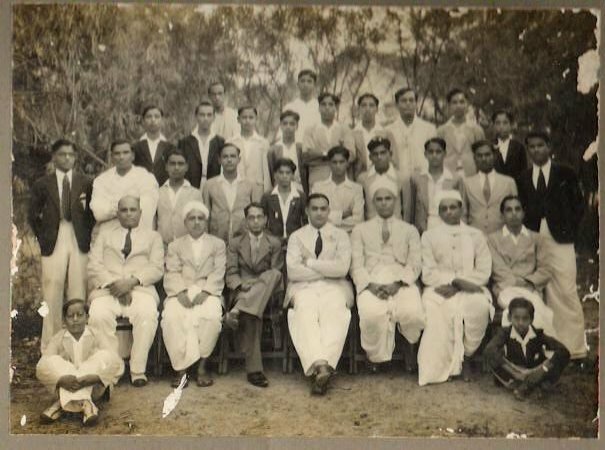 This exodus into Madras was largely fuelled by two overarching trends: The opening up of employment opportunities under the British for educated Indians and along with it, a chance to educate one's children in the academic institutions of the city. Jobs in Government departments and English Trading firms were in abundance for matriculates. A Government job carried with it, that elixir of the middle-class, an assured pension, usually proving to be the single, clinching factor in the choice of a profession. This was also an era where wealthy city-based zamindars and landowners held sway in local business circles. Functioning as intermediaries between the British trading firms and local suppliers, these zamindars perhaps constituted the first breed of entrepreneurs from Tamil Nadu. Financial prosperity brought with it the curious matters of bookkeeping, profit sharing regulations, tax-filing procedures and associated court litigation in the case of disputes; Matters which required the assistance of trusted, capable, young civil lawyers. To add to the list of happy co-incidences, the legal system in those times allowed undergraduate degree holders in any discipline of study to opt for the legal profession. So, bright, ambitious undergraduates in Physics, Accountancy, Commerce and even Mathematics would be taken under the wings of busy, leading lawyers who had already made their mark. What followed would be an intensive, apprenticeship period of 3-4 years where the youngsters would train on real-life cases, at the same time pursuing formal legal education at the law college and court. This sequence of events culminated usually in the young lawyer gaining a thorough training in the intricacies of corporate law of the land, thus providing a springboard to a successful career as an advocate. Understanding this social backdrop will help in appreciating the Palathope story better. Around 1908, Alladi Krishnaswamy Iyer and Subbaraya Iyer moved to Palathope from the 'Town' area to work as apprentices in the offices of the illustrious lawyers of Madras - V. Krishnaswamy Iyer (of Madras Sanskrit College and Indian Bank fame) and Sir C.P Ramaswamy Iyer (erstwhile Dewan of Travancore) respectively. Staying as tenants of Kodiyalam Srinivasa Iyengar in what is now Justice V. Ratnam's bungalow (the same bungalow where I meet with the Palathope residents); both Alladi and Subbaraya Iyer began their journeys into the world of law from Palathope. Apprenticeship under a leading lawyer in those days meant long hours of hard work in the lawyer's office (usually also his home) before and after the court sessions held during the day. Palathope, being close to the Mylapore residences of V. Krishnaswamy Iyer and Sir C.P. Ramaswamy Iyer, was a suitable choice for the young Alladi and Subbaraya Iyer. It was not long before Subbaraya Iyer bought the next-door property to where he was staying as a tenant - a verdant Keerai Thottam. A piece of land on which he constructed his mansion - a heritage bungalow today, which his descendants still live in and care for lovingly. Charged by the success of these early achievers, the careers of other lawyers down the street were also taking off at around the same time. A Palathope based family that had migrated from Andhra, produced a father-son duo - M.S. Ramachandra Rao and Jagannatha Rao, both of whom held the posts of Judge of the Andhra High Court during their careers. In fact, Jagannatha Rao went on to become the Chief Justice of the Kerala and Delhi High Courts as well, before becoming the Chairman of the Law Commission. M.S. Venkatarama Iyer, a fine Civil Lawyer ran a prestigious, legal office from Palathope, which produced many luminaries - most notable among them being, R. Venkataraman, the former President of India. M.R. Narayanaswami who started as a student in Palathope and was a junior of M.S.V blazed a trail in the field of labor litigation before ending his career as a Senior Lawyer in the Madras High Court. Justice A.V. Viswanatha Sastri (father of Justice V. Ratnam) and T.S Raghavachari were eminent lawyers as well who set up home next to each other in Palathope. As all this frenetic activity was happening, Madras itself, stood witness to India's historic Independence movement. The "Poorna Swaraj" campaign gained active support amongst this, by then, influential lawyer community. Womenfolk of the house voluntarily parted with all their gold bangles when Gandhiji addressed a large gathering in Madras in the 1930's and asked every person to step forward and do his/her bit for the motherland. These were happening times indeed for the nation as a whole, and Palathope and its residents were fortunate to be in such close proximity to history in the making. It was against this backdrop then, that the lawyers of Palathope went on to prosper and carve their respective niches in the annals of legal history in India. These were men who were giants in their achievements (Alladi went on to be part of the commission which drafted the Constitution of Independent India, Subbaraya Iyer was the educational institution builder par excellence), yet endearingly humble and approachable. With such a rich heritage in varied fields of law, be it Civil law with specializations in Corporate taxation or Criminal law and its allied subjects, it is but natural for one to draw parallels of Palathope with the hoary Harley Street of London famed for its medical establishments. Producing a brigade of lawyers, not just adept at their profession, but also with a social conscience. Does that explain Palathope in its entirety then? A little further probing and a whole, surprising, new view of Palathope reveals itself. I am pleasantly surprised to know that the inimitable G.N. Balasubramanian (GNB), that doyen of Carnatic music, took residence in Palathope in the 1930's-1940's under the patronage of the lawyer turned music lover, C.K. 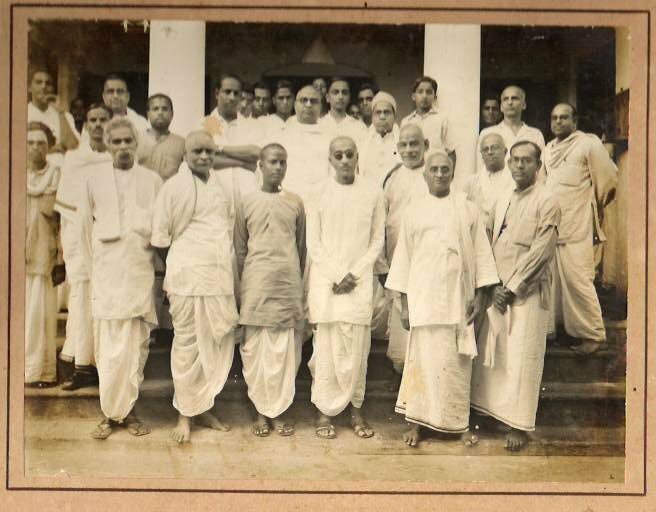 Venkatanarasimhan's (also one of the earliest Secretaries of the Music Academy) family. It is but fitting, that Palathope graced the list of 15 addresses that GNB was reputed to have stayed in, when in Madras. E. Krishna Iyer, the man responsible for the re-christening of 'Sathir' as 'Bharathanatyam' was a man of Palathope as well, and lived next door to GNB. Modern day Madras and all its schools of classical dance should be deeply indebted to E. Krishna Iyer, for endowing Bharatanatyam with a sense of social respectability and acceptance and in the process revealing to the common man, the divinity and devotion associated with the dance form today. Palathope's tryst with destiny extends to a deep passion for the 'Tamizh' language as well. The people I speak to, have vivid memories of engaging Saturday afternoons in the late 1930's when the 'Myzhai Tamizh Sangam' would convene in the courtyard of Subbaraya Iyer's house. Carrying the laudable objectives of propagation and appreciation of the Tamil language amongst the general public, the Sangam died a sad death in 1942, thanks to the World War evacuation happening in the city. At its peak, the Sangam meetings were attended by Kalki Krishnamurthy, Rajaji and were witness to many a passionate discussion on the virtues of the language and its literary epics. As my meeting draws to a close and we silently close the pages on a golden chapter of history, the rude honking of a motor vehicle's horn awakens us to reality and to the present. Palathope today, is plagued by challenges of a more mundane nature; problems of indiscriminate and wanton parking of vehicles at the entrance to this narrow road, thus making the entry and exit of the owners' vehicles a veritable nightmare. There is mass littering of the street, thanks in large part to a road-side eatery which has sprung up on the main road adjoining the entry to Palathope. Visitors to the congested Mada streets, find Palathope's cul-de-sac a convenient location to park their two-wheelers while they shop around. And to top it all, in one of life's bitter-sweet ironies, the residents of Palathope good-naturedly complain to this writer that the 'Mylapore Times' newspaper never, ever gets delivered to their households. If, along with awakening the people of Mylapore to the colorful history of this locality and imparting in them a sense of pride in the neighborhood's institutions, this project also succeeds in ensuring a certain, basic, civic sense in the residents, thereby ensuring the preservation of the heritage value of these streets and buildings, we will consider our job well done. Please update the blog... Mylapore is the best place to live and always there will be some news around the croner... Please update this blog - I'm in London and i really feel happy when i open your blog - It gives me a feeling that i cannot fill it with 26 letters. I have lived all my life in Palathope and yet had to be reminded of our History. thank you very much. i treasure this a lot.. Thanks for reminding us the history. I love Mylapore. Please update the blog. I am shifting my residence to Palathope and am happy that this neighborhood has history written all over it. This will make me love this place much more! Thanks for sharing so much of information! I grew up in Palathope. All my happy memories of my childhood happened here. I am evr so grateful for the thatthas and paattis who used to be outside in the evenings watching us kids play. I wish I had the same setup here in the US, where I amafraid to send my kids out to play in the streets. Also, please mention PVR, the thamizh writer who used live there as well.